On 5 September, Prime Minister Narendra Modi met French President Francois Hollande on the sidelines of the G20 summit here in Hangzhou. Both leaders met for the first time after Hollande visited India this year to attend the Republic Day parade as the chief guest. "Strengthening the Strategic Partnership with France. PM @narendramodi has a quick pull aside with President Hollande," said Ministry of External Affairs official spokesperson Vikas Swarup in a tweet. Indo-French relations received a boost in 2015 with high-level engagements and expansion of the already strong cooperation. Prime Minister Modi paid a landmark visit to France between 9-12 April, 2015. The two leaders held a bilateral meeting on the sidelines of the United Nations General Assembly in New York in September 2015. They again met in Paris on 3 November, 2015 at the Leaders' Event of CoP-21 (21st Session of the Conference of the Parties to the United Nations Framework Convention on Climate Change). 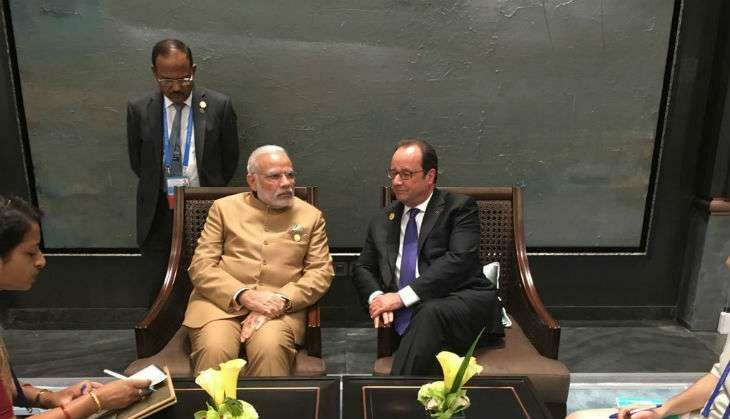 Hollande paid a three-day visit to India from 24-26 January this year. During Hollande's India visit, both countries signed an inter-governmental pact to buy 36 French-built Rafale fighters leaving the task to the negotiation committee to resolve financial issues.